Welcome to Adjust Your Altitude in Pigeon Forge! 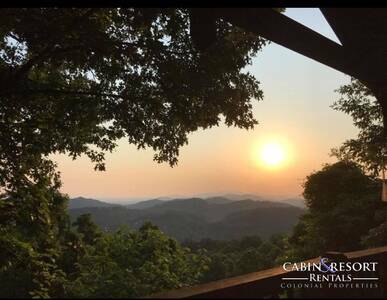 This relaxing and beautiful 2 bedroom, 2 bath Smoky Mountain cabin rental is an exceptional place to spend your next vacation getaway. Step inside and you’ll be surrounded by soothing natural wood accents, tasteful décor and furnishings, and all of the features and amenities your heart desires. The expansive living room provides you with a soaring cathedral ceiling, cozy fireplace, large flat screen TV, deck access, comfortable seating, and even a fun and exciting pool table for countless hours of fun and enjoyment. Located just off of the living room is the amazing kitchen and dining area. Here you’re treated to custom shelving, stainless appliances, deck access near the BBQ and outdoor hot tub plus picnic area, and two bar areas that are a great place to grab a snack or your favorite beverage. Step into the queen bedroom and you’re greeted by a custom made log bed, flat screen TV, and a full bath just steps away. 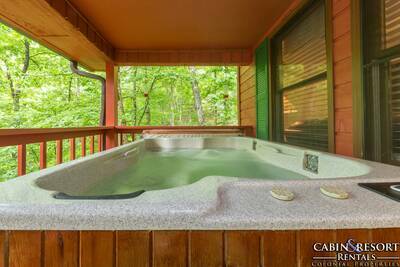 The luxurious master suite is truly an exceptional place to relax while vacationing in the Smokies. This amazing bedroom provides you with a custom 4 poster log king bed, electric fireplace for wonderful ambiance, a flat screen TV, and a private ensuite full bath. 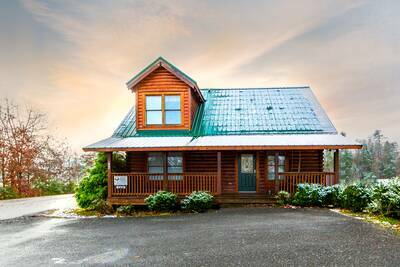 This beautiful Pigeon Forge cabin rental offers you and your guests complimentary high speed WiFi internet for your use and enjoyment while vacationing here. Adjust Your Altitude is all one level, and offers easy entry from the parking area via a ramp or stairs. 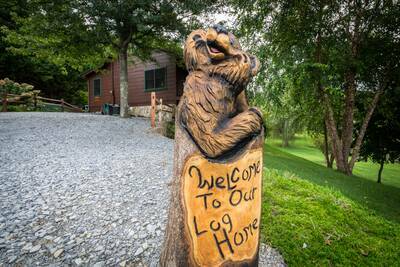 Conveniently located near downtown Pigeon Forge, you’ll have quick, easy access to Dollywood, The Old Mill District, The Island, and countless shops and restaurants. If you’re searching for the perfect place to spend your next Smoky Mountain getaway, definitely make reservations today at Adjust Your Altitude! A: This cabin has WiFi internet. A: Hi Ashley! 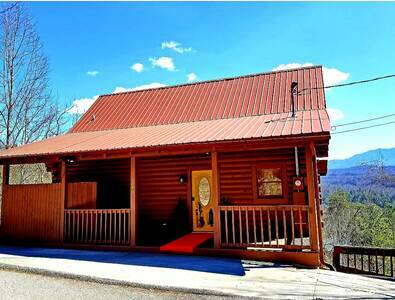 This cabin is approximately 15 minutes to the main strip in Pigeon Forge. A: Hi Emily! Adjust Your Altitude is not pet friendly. We do have other properties that are pet friendly. A: Hi McKenze! Adjust Your Altitude has one sleeper sofa and one futon. A: Hi Dylan! To rent a 1 Bedroom Cabin Rental you must be at least 21 years of age. To rent a 2+ Bedroom Cabin Rental, you must be at least 25 years of age. “ The cabin was very clean and my Fiance and I loved the location. The kitchen and all amenities inside the cabin were great. This was our first trip to the area and we will definitely be renting another cabin next year! “ Loved everything about this cabin. The master bedroom is BEAUTIFUL! That bed is gorgeous! 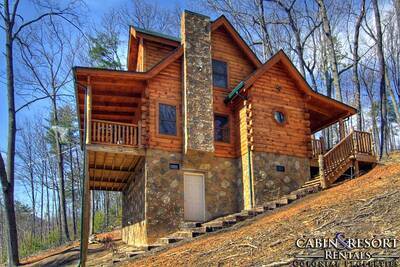 “ Very nice cabin with many amenities. Enjoyed!! “ Love the setting of the cabin. “ Everything was perfect, great customer service. 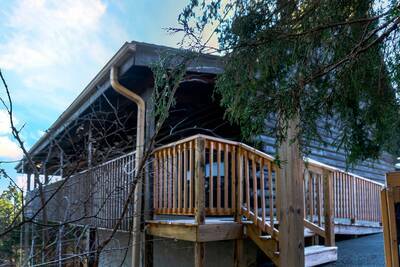 “ Cabin was very nicely renovated & very very clean. Highly impressed with the overall stay.